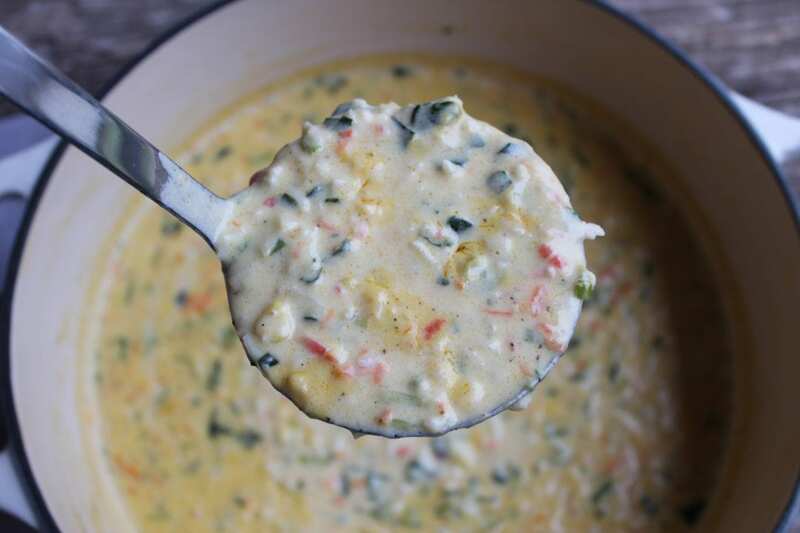 This Crab and Corn Chowder recipe brings back so many memories of a summer trip to the Florida coastline a few years back. The wind whipped down the pier and the faint call of seagulls could be heard over the crashing surf. Boats of all sizes and types could be seen across the dock and the deep bass of boat horns could be heard as they made their way to dock. I just described my first introduction to the Florida Coastline and this delicious Crab and Corn Chowder. A few years back we visited Panama City, Florida for a family vacation. I had visited the California coastline, but never Florida until that trip a couple years ago. We were told by the locals that Captain Anderson’s was the place to be for the best, freshest seafood in all of Florida. Let me just say, they knew what they were talking about! Everything from the appetizers to the main dish was absolutely perfect in every way. I ordered a delightful Seafood Pot Pie that tasted exactly like this Crab Corn Chowder – just in a pie crust. Since that trip in 2016, I have been craving the flavors of that beautiful seafood restaurant. As you may know, living here in Central Arkansas I’m quite a distance from any coast. With us being so far inland, we don’t have access to fresh seafood and certainly not in your average grocery store. 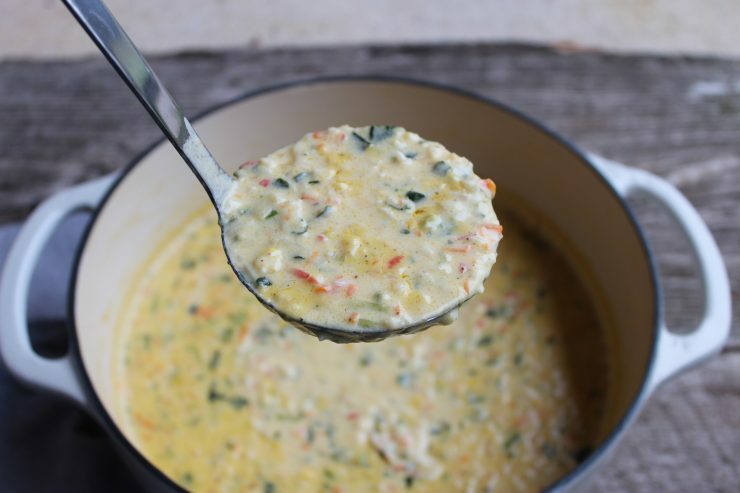 I created this Creamy Crab and Corn Chowder recipe using the best ingredients I had access to. I did have to use imitation crab meat which I know is probably an insult to those of you that have access to the real thing. However, if you do have access to pure crab meat, I highly suggest using that because the real deal will always be better. You could also use canned crab meat if you prefer. Let’s start out by adding 3 cups of chicken broth and 5 tablespoons of butter to a 4 quart or larger Dutch Oven or stock pot. I used my own homemade chicken broth which was frozen, so as you can see, I had to wait for some of it to melt. Set the heat to medium and allow the butter to melt into the chicken broth, stirring it occasionally to prevent burning. 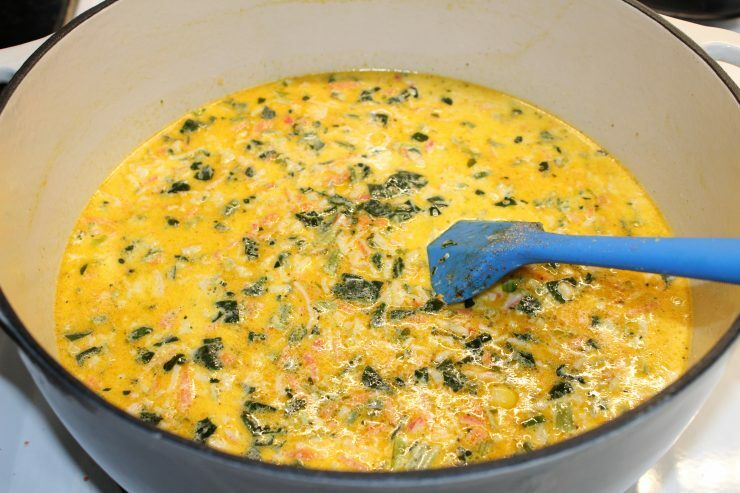 Once the butter is melted, add in 1 1/2 cups of frozen, whole kernel corn, 5 ounces of frozen, chopped spinach, 3 stalks of diced green onion, and 1 cup of freshly shredded carrots. Stir the veggies into the liquid in the pot and add your seasonings. 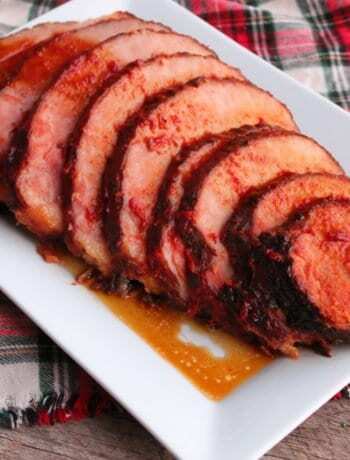 You’ll need: 1 tablespoon fresh minced garlic, 1/2 teaspoon garlic salt, 1/2 teaspoon seasoned salt, 1/2 teaspoon ground black pepper, 1 teaspoon Old Bay Spice, 1 teaspoon onion powder. Stir the seasonings into the other ingredients in the pot and continue to cook on medium high. 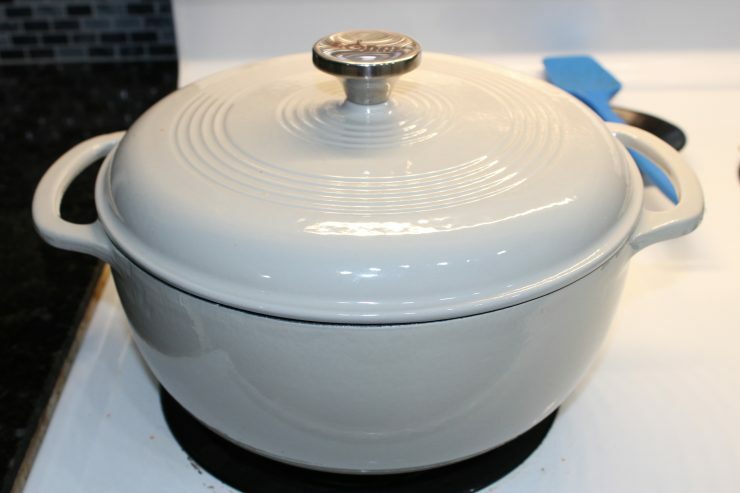 Place the lid on the Dutch Oven or stock pot and allow the veggies to cook on medium high for about 15 minutes. 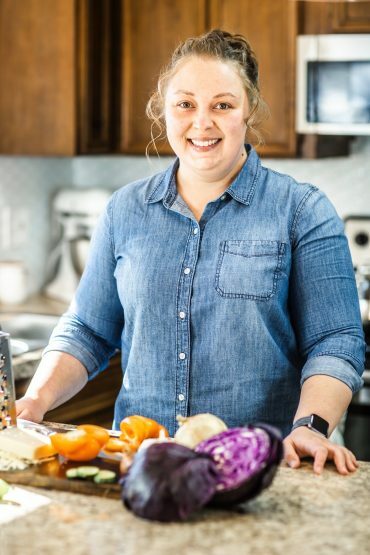 You want the veggies to cook until completely tender, so you may need to adjust the cook time or temperature according to how your stove cooks. While the veggies cook in the butter and broth until tender, place 12 ounces of Crab meat or imitation Crab meat into a small bowl. 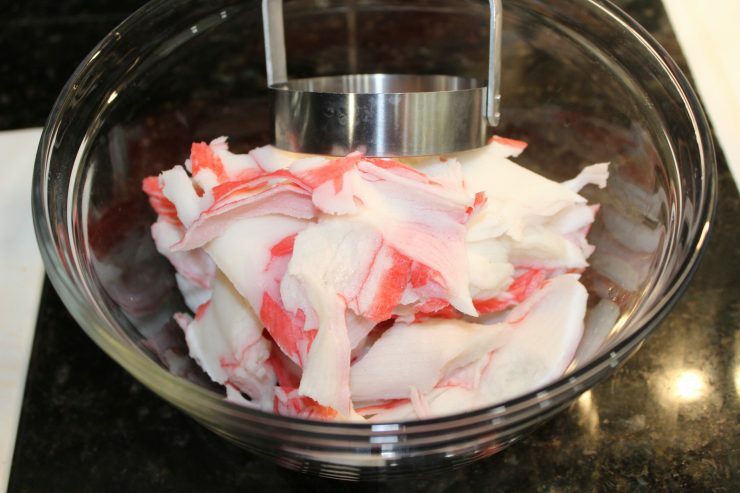 Chop the crab meat with a biscuit cutter until it is minced into small pieces. Using a biscuit cutter to chop the crab meat may sound weird, but it’s a handy little kitchen hack I have learned. Using a biscuit cutter to chop vegetables or meat is so much faster than using a knife! 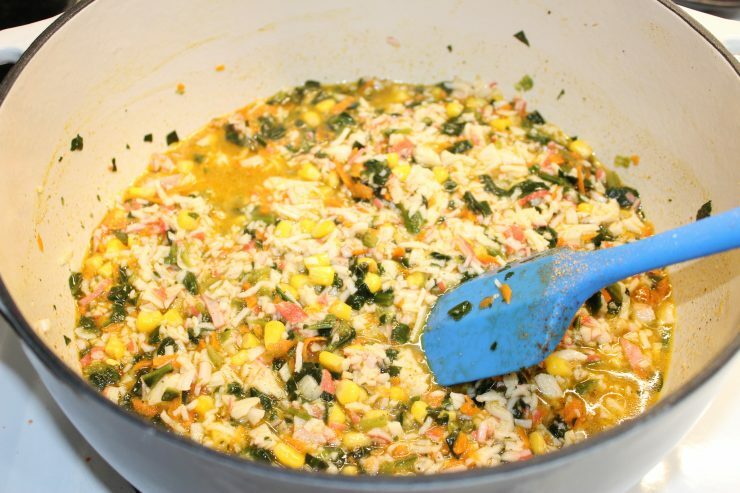 Add the chopped crab meat to the ingredients in the Dutch Oven or stock pot and stir well. There won’t be a lot of liquid in the pot but don’t worry, we’re about to add some. Now that the veggies are cooked until tender, add in 2 cups of Heavy Whipping Cream and 3 cups of Whole Milk. 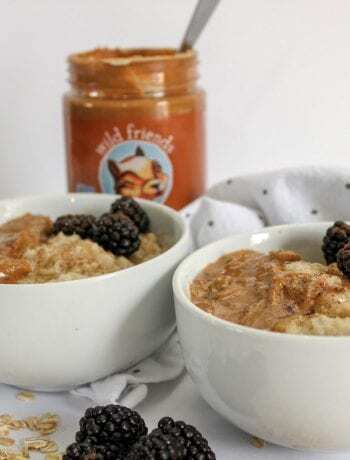 Reduce the heat to medium low – you don’t want the milk and cream to curdle! While the Crab Chowder simmers on the stove, add 1 cup of whole milk to a measuring cup along with 3 tablespoons of all purpose flour. 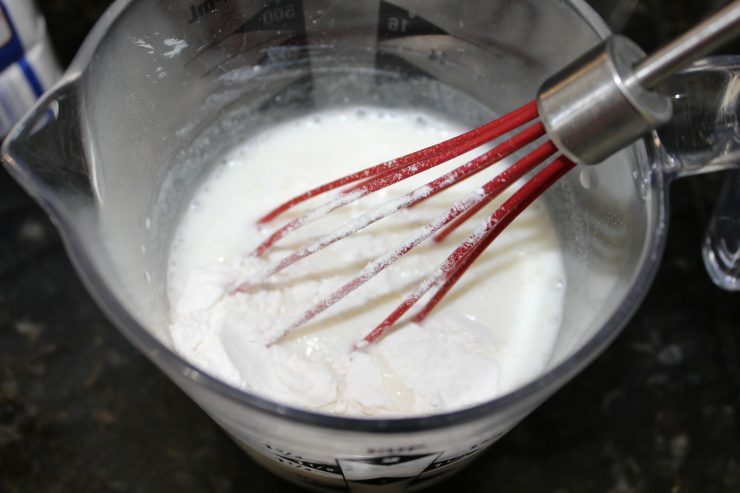 Whisk the milk and all purpose flour together until completely smooth with no lumps remaining. Creamy Crab and Corn Chowder is Ready to Serve! 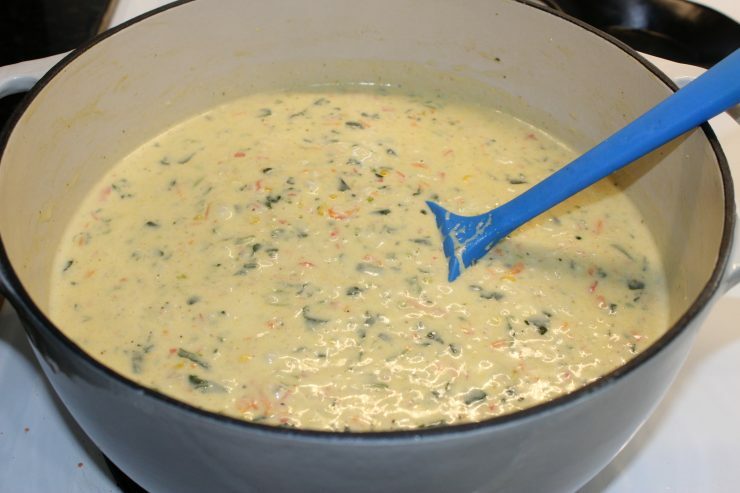 Pour the milk and flour mixture into the Creamy Crab and Corn Chowder and stir continually. The crab soup will begin to thicken into a chowder as you stir, creating that wonderful, thick and creamy texture of a seafood chowder. 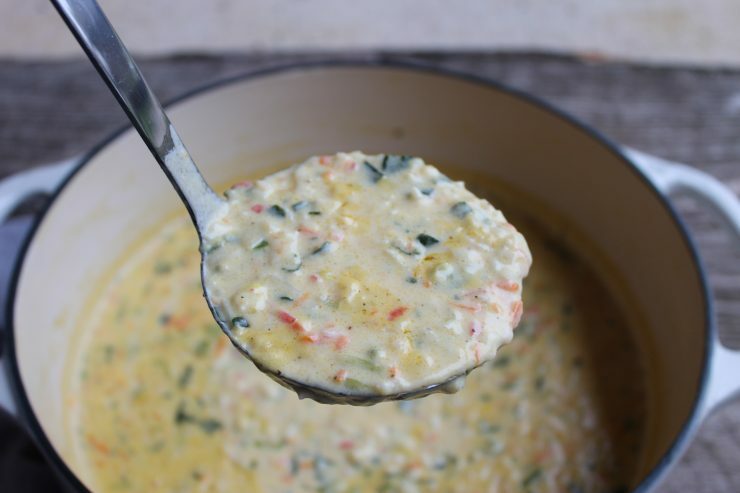 Serve this Creamy Crab and Corn Chowder while fresh and piping hot. If you have bread bowls, you can slice the top off, scoop out the middle, and pour this steaming chowder into the warm bread bowl for a delightful presentation. We also like to eat this seafood chowder with saltine crackers or oyster crackers on the side. 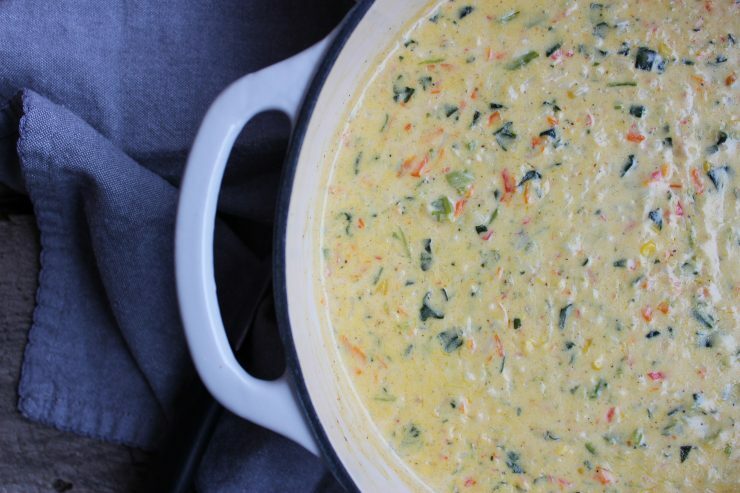 Looking for some side items or appetizer ideas that pair beautifully with this chowder? I’ve got some wonderful suggestions for you. If you love shrimp, try this Shrimp Scampi from Julia’s Simply Southern – it won’t disappoint! Another great side dish to pair with this chowder is Shrimp and Grits with Andouille Cream Sauce from Soulfully Made. Finally, add these Crab Stuffed Mushrooms from Norine’s Nest to your seafood menu for a wonderful appetizer. I hope you have enjoyed your time in my kitchen today as we created a wonderful, seafood chowder the entire family can enjoy. Cozy up to the fire with a bowl of this Creamy Crab and Corn Chowder and enjoy the flavors of the Florida Coast, right in the comfort of your own home! As always, I love having you here with me as we cook and reminisce together and I do hope you will come back soon for another visit. This Creamy Crab and Corn Chowder brings all of the flavors of the Florida Coast to you in a warm, comforting dish. Pour the chicken broth into a 4 quart or larger stock pot or dutch oven and add the butter. 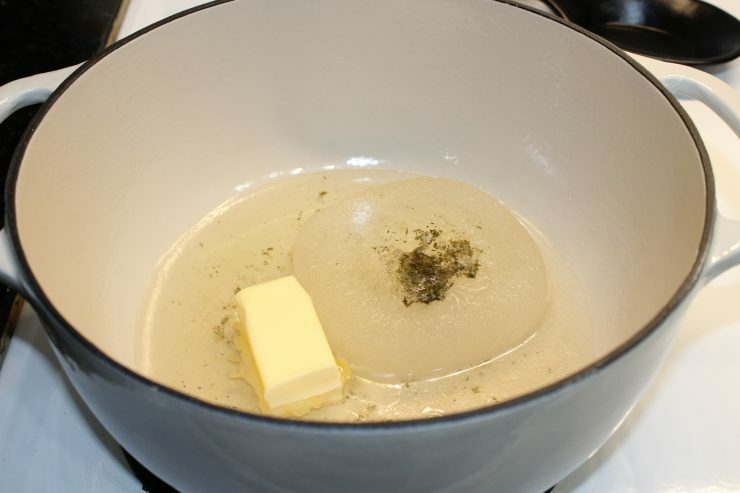 Set the heat to medium and allow the butter to melt while stirring it into the chicken broth. Once the butter is melted, add in the spinach, corn, carrots, green onion, minced garlic, garlic salt, old bay spice, onion powder, and ground black pepper. Stir all ingredients and place the lid on the pot. Allow to cook on medium high heat for 15 minutes or until the vegetables are cooked and tender. Place the crab into a a mixing bowl (I used imitation crab) and use a biscuit cutter to chop the crab into small pieces. 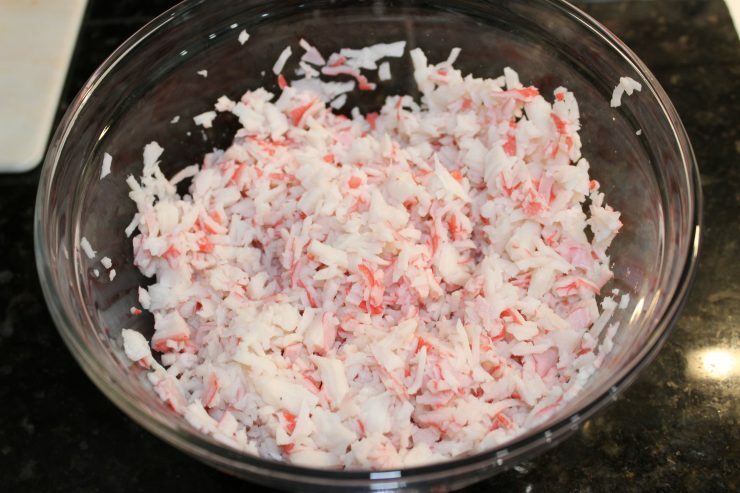 If you're using real crab be sure to remove any pieces of shell that might be in the meat. Add the chopped crab to the stock pot with the other ingredients and cook an additional 10 minutes. Turn the heat to medium low and add 3 cups of milk and the heavy cream. Stir the milk and cream into the other ingredients. In a mixing cup, combine 1 cup milk with 3 tablespoons of all purpose flour and whisk together until smooth. 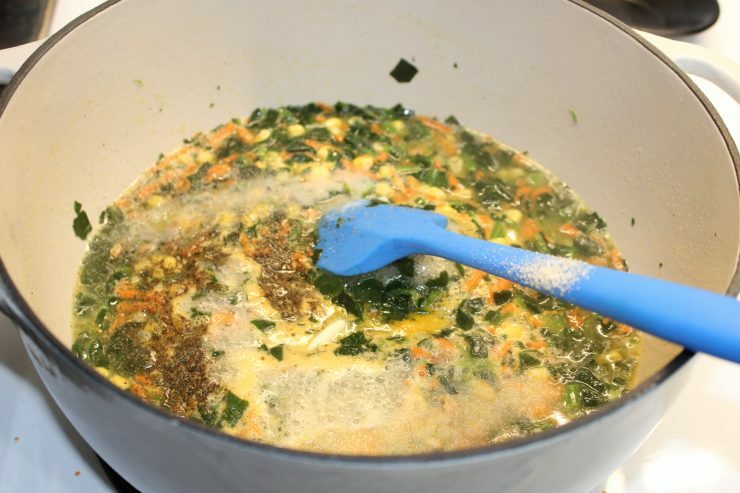 Stir the milk and flour mixture into the ingredients in the stock pot and continue stirring until the contents thicken. Remove from the heat and serve immediately or keep the heat on simmer until ready to serve. I used imitation crab for this recipe because nothing else was available in the region where I live. If you have access to fresh cooked crab, I suggest using that over imitation, although the imitation crab did give this recipe a wonderful flavor, the real deal is always going to be better. I love a good chowder! Thanks for sharing at the What’s for Dinner party – hope your week is great! Chowder is perfect for a cold, winter night! 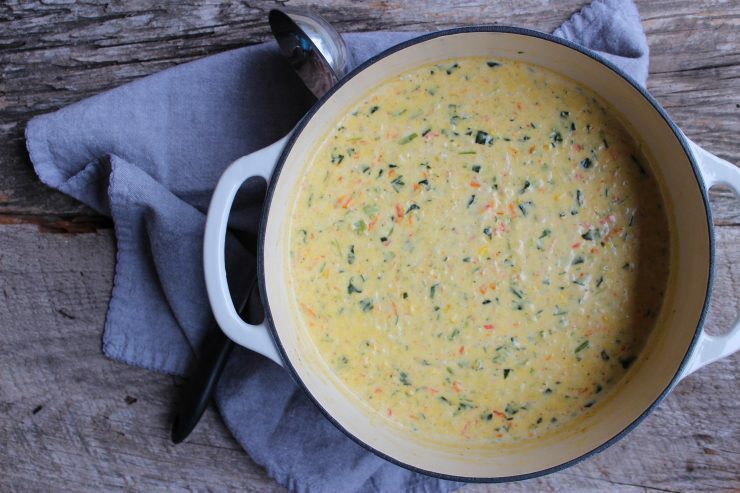 What a beautiful chowder, we will really enjoy this recipe! 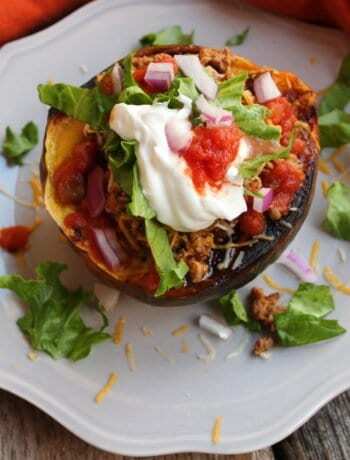 Hope you are having a good week and thanks so much for sharing with us at Full Plate Thursday!